Discussion in 'Online Games - News and Reviews' started by Kotsy, Apr 21, 2013. Play Worms for real money online and get super stacked wilds or a chance to play 1 of 3 bonus rounds! Bring in the winnings playing this one. 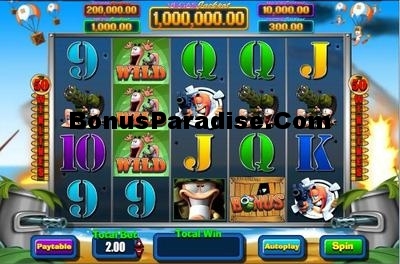 Worms is a 50 payline, 5 reel, 3 row video slot. All wins pay left to right, except the Bonus Scatter. The Wild symbol can appear anywhere on the reels and can be stacked. Even Super Stacked! Where it could cover the entire reels. It substitutes for all symbols except the Bonus Scatter. Receive 3 or more Bonus Scatter symbols and enter the bonus round. Select a Bonus Crate to reveal which 1 of 3 bonus rounds you'll enter. Revealing Sgt Major starts the free spin battle with unlimited free spins. Revealing Cosmo Worm starts the Space Trail Bonus where you move around the board and could win up to 1000x your bet. Revealing the Scot Worm starts the Crate Escape Bonus and you could win up to 100x your bet.